Derby hero Scott Arfield described his winner against Rovers at Ewood Park as the greatest moment in his career. 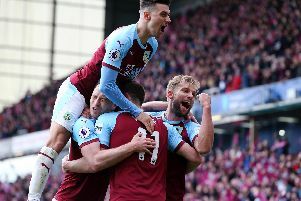 The Scot struck after the hour, side-footing beyond Jason Steele from 20 yards, to earn the Clarets a second successive triumph over their rivals. The 26-year-old, who opened his account for the season, said: “I’d say it is. It’s the best feeling I’ve had as a professional footballer. “I can’t really remember much about it. You’re in a bubble. “You can’t really describe the feeling of scoring a goal, especially in a derby like this. The midfielder, who hadn’t scored in over nine months when netting against QPR in the Premier League at Turf Moor, added: “It was lovely. I can’t really remember much about it. I think the keeper got slight fingers to it and maybe makes it look better than it was, but I was delighted with it and ran the full length of the pitch to celebrate. We all did.